Light and bright, pristine and filled with upgrades! This 3 year young open floor plan Trevi model located in The Sanctuary at River Strand is uniquely stunning and defines Florida living. The resort style heated zero entry pool, lighted Har-tru tennis and pickle ball courts and fitness center are just steps away from your front door. Enjoy playing the 27 hole Arthur Hills designed golf course, dining in 2 fabulous restaurants and relaxing at the fun tiki bar. The social membership with year-round scheduled activities in the Golf and Country Club is included in the dues as well as grounds maintenance, cable and internet service. The 4th bedroom in this home was converted to an office, finished with french doors and ceiling fan. Beautiful high end white plantation shutters throughout including 3 sliding panel shutters on the sliders leading to a paver screened lanai. Expansive lake views from the lanai and your master bedroom suite window. 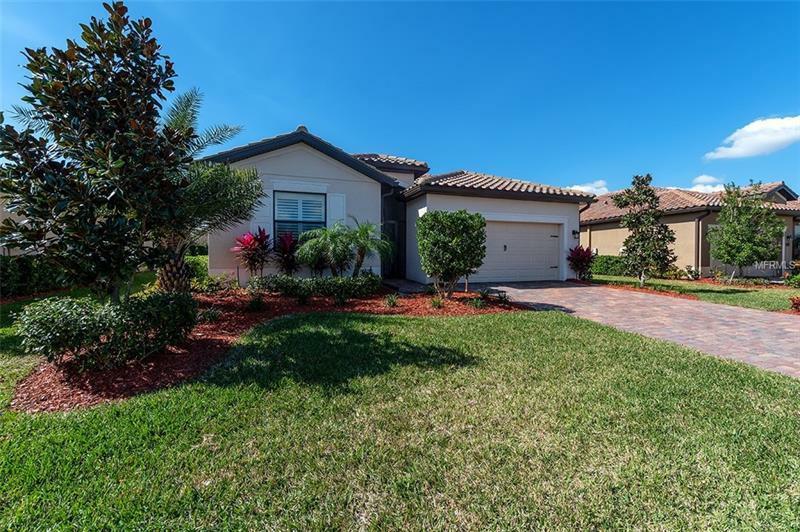 Additional upgrades include tropical landscaping, paver driveway, interior light fixtures, ceiling fans, Culligan water system, front door screened enclosure, diagonally laid ceramic tile, crown molding and total house gutter system. Freshly painted interior and an epoxy garage floor. Just roll into your two car garage and begin your vacation lifestyle!